I've created a bookshelf on Shelfari for the books I'm considering for the theoretical framework. Utilizing Shelfari, books became easier to list than papers so I thought to start with sharing them with you until I'm able to compile a list of the papers and get them posted. The gadget on this blog on the lefthand side shows a list of those books. I'm also posting the gadget here in this post. I'm trying to somehow limit my scope to the books that are available electronically and specially through kindle, but I'm open for suggestions for books you believe would offer an added value. In the previous post I shared with you the definitions of Web 2.0 in the process of looking at Service 2.0 as an inspiration of Web 2.0. 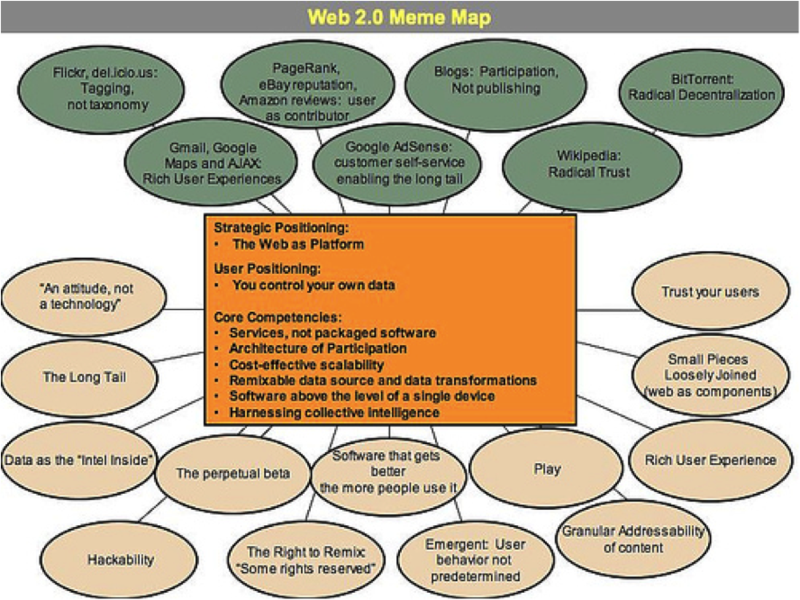 In this post, I'll focus on the principles of Web 2.0 as per the work of Tim O'Reilly. 7. Lightweight user interfaces, development models, AND business models. In 2009 O’Reilly presented a new paper named “Web Squared: Web 2.0 Five Years On” where he stressed, redefined some older characters and add new ones. The new discussed 4 aspects about the web 2.0 included: sensory-oriented collective intelligence, the learning web, the information shadow of reality on the web, and the real-time collective mind. a. Value gets created in the service delivered over the platform (Google vs. Netscape case). c. Long-tail focus through customer self-service and algorithmic data management (Adsense vs. Doubleclick case). d. Architecture of participation: new users bring new resources, the service gets better automatically as the network of users grows (BitTorrent vs. Akamai case). a. The product is the collective work of the users. The product grows organically due to the user activity (eBay case). b. Provider’s role is to enable the context of user activity. c. Value is in the value of user participation to create flow around products offered (Amazon vs. barnesandnoble.com case). f. Viral marketing as recommendations propagating from one customer to another vs. traditional advertising (Sourceforge.net case). g. Open-source: or Open-anything as a product of collective-intelligence in production. h. Network effects are the key for dominance in Web 2.0 era. i. Blogosphere turned the web into a sort of a global brain with conversation going on all the time. j. The crowd of wisdom: The constant interactions of members of the crowd define the visibility and power of members or artifacts. k. We, the media: the audience decides what’s important and not the traditional media provider. l. Smart devices –not only humans- are feeding data all the time on location, speed, view, this data is being collected, presented and acted upon in real-time. o. The network gets smarter as it grows. Combination of devices capabilities, access to networks and crowdsourcing define a new level of intelligence. p. Discovering implied metadata, and building a database to capture that metadata and/or foster an ecosystem around it. 3. Data is the Next "Intel Inside"
a. Infoware: Products that are relying on databases as a main competency, where the data is the major asset. b. Control on over databases defines market control, and allows for financial returns and leveraging of network effects (YAHOO, Google, Amazon, eBay and Network Solutions cases). c. Ownership of data is the competitive edge and not the ownership of software which could be imitated or open-sourced (MapQuest vs. YAHOO, Microsoft and Google case). d. Enhancement of data by provider’s own efforts or by harnessing collective intelligence creates a huge added value on publicly available or easy-to-imitate databases (Amazon vs. Barnesandnoble.com case). f. The high expense & return in creating the data will put the data at the center of competition on ownership. g. Network-wide data systems could be formed to provide reliable aggregate data source systems. These data systems will be a major component in the “internet operating system” and will enable future applications (the case of identity systems relying on PayPal, Amazon 1-click and Google use of cell number as an Identifier). h. Open-Data: Due to the importance and criticality of ownership of data, data-owning providers (like Amazon) may start to be more enforcing for their data copyright policies. This will lead to the rise of free data movement leading to open data project as in the case of the proprietary software, free software movement and open-source (Wikipedia and Greasemonkey examples). a. Looking at the software as a service rather than a product implies fundamental changes to business models. b. Operations are a core competency. Operations are more critical than the software artifact. Data has to be constantly and continuously maintained and operated. (the case of Google’s search algorithm vs. Google’s system administration, networking and load balancing). This implies change in the development tools suitable for building dynamic systems enabling the constant change. c. Users must be treated as co-developers. d. The move from “release early and release often” to the “perpetual beta”. Service may continue to be in beta mode years after release with. e. Frequent monthly, weekly & daily updates or even every-half-hour build update rate. f. Real-time monitoring of user-behavior and response to new features is a major new competency. g. This pace of development is a challenge for traditional providers who require radical change in their development lifecycles, design patters and corresponding business models and revenue sources. a. Simplicity guarantees higher adoption than complication. Simple models are highly adopted than formal corporate sophisticated models (Amazon’s case of 5% corporate SOAP and 95% simple REST). b. Allow for loosely coupled or fragile systems than tight corporate-bases coupled systems. c. Think Syndication and not coordination: Care more about getting the data to the other side rather than controlling the data on the other side. d. Design for Hackability and remixability: Decrease barriers for reusability. Allow users to access things the way they want when they want. Allow users to decrypt, hack, remix and reuse the components of the service creatively (Google Maps Case vs. ESRI). f. Innovation in assembly: Allow easy reuse and remix of existing services for a third-party to provide a new service. The abundance of accessible and reusable services’ components will allow for a new competition on the use of existing services to create new services. This availability will also give room for differentiation for existing providers who can reuse components from other services to enrich, renew and reposition their own. a. Allowing seamless integration of multiple devices, web and software. b. Devices will not only consume data but will also produce and report data (Car & traffic monitoring example). a. Development of the tools and standards allowed for the creation of interactive rich applications. b. The attempts from both directions of providing desktop-like rich web applications from one side and integrating web and online features continue to enhance the user experience. c. Rich Applications have the power of learning from user, accessing the user’s data and leveraging the architecture of participation and collective intelligence of the social network. As the first approach of defining Service 2.0 is through seeing Service 2.0 as an inspiration of Web 2.0, this post will share some contributions for defining Web 2.0. Since then, efforts have been done to study if Web 2.0 is more of a buzzword and marketing Jargon than a clear term with a clear definition, where does the web 1.0 end and where does the web 2.0 begin? (Madden et al 2006). 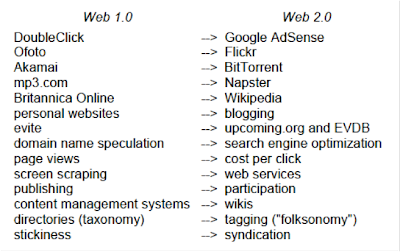 Another research was done by Cormode and others in 2008 to come up with clear distinction between Web 1.0 and Web 2.0 and also between Web 2.0 and what could be mistakenly thought to be the whole Web 2.0 like social networking. In their systematic review for the terms health 2.0 and medicine 2.0 De Belt (et al 2010) have concluded that the term web 2.0 is currently accepted among authors and listed 2 definitions. The definitions they listed included O’Reilly’s definition of Web 2.0 as “a set of economic, social, and technology trends that collectively form the basis for the next generation of the Internet, a more mature, distinctive medium characterized by user participation, openness, and network effects” and Hansen’s definition of Web 2.0 as “a term which refers to improved communication and collaboration between people via social networking” and they concluded that the main clear difference is the move from uni-directional to multi-directional interaction. They concluded that 2 meanings of Web 2.0 could be spotted from definitions. The first meaning is that Web 2.0 is a combination of technological developments while the other is that Web 2.0 is not the technology but it’s what the technology enables of empowering people (De Belt et al 2010, P. 6). Eijkman presented another definition of Web 2.0 as ”new internet services which enable users to collaboratively create, share and recreate knowledge from multiple sources, leverage collective intelligence and organize action” which is more focused on the value that gets created on the platform than the platform itself. Through his highly cited paper on the topic, O’Reilly has separately highlighted 3 major characteristics of Web 2.0 as the most important ones where he literally said “Web 2.0 is …” These 3 characteristics were “harnessing collective intelligence”, “We, The media” (meaning that the audience decides what’s important) and “The network as a platform”.